thesapphiregallery has no other items for sale. Antique Metal Outdoor Patio Bench Natural Oxidation & Rust Finish Great Cond. 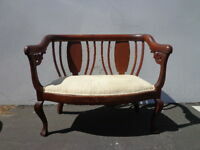 English Hepplewhite Mahogany Window Hall Bench Newly Upholstered, Circa 1920"